Beautiful all week. Our favorite restaurants were Jack Mackerels in Kure Beach and Dockside in downtown Wilmington. My wife Rachel and I finally shared our best kept secret that we were going to be parents for the first time. Thank you so much for renting us this beautiful house and making memories we will never forget! Thank you so much! This is one of our most relaxing and memorable vacations! We like to find special places on the ocean for our anniversary to celebrate and this was definitely a special place. Thanks for the advice about Britt's Donuts, it is a must! Life is so much about expectations. Well, given the reviews and the info on the area, the bar was set pretty high. Still our experience exceeded and and all notions we had. Great active days and splendid sleep filled nights were just what we needed. Suffice it to say we lacked for nothing! We too are coffee enthusiasts ad the samples were great but went quickly! The weather was sunny and beautiful. The most enjoyable part of this vacation was your home. We couldn't have asked for better accommodations, everything we could think of was provided. Other special places were the Aquarium. the Pier and the beach itself, thank you! The condo was very clean and the views were great. Although it rained the first couple of days it was still incredible because we didn't have to leave the deck the enjoy the ocean. The unit had everything we needed to feel at home. The rec center was fun for the kids and a short walk. Really enjoyed our stay. Thanks so much. We really enjoyed our time at the beach, Wilmington and Southport! Great location, it was a perfect place to vacation on our way to take out daughter to Duke. The battleship is a must but we'll pass on Squigly's next time. We loved this condo. By far the best we've ever stayed in! They have everything you could ever need (household items, kitchen items, books, movies, umbrellas, chairs, beach toys, etc). Everything was spotless and recently updated. Not many steps to go up and plenty of room for 2 cars. The location was nice. 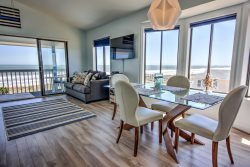 Within walking distance to stores, restaurants and the boardwalk. You must go to Britts! I would highly recommended this place! Enjoyed the location of this spot and how accessible the property is to the beach, restaurants and other sightseeing adventures. Comfortable furniture for relaxing in the evenings. What we saw and discovered: Sunrises, dolphins jumping out front, beautiful scenery - Fort Fisher. Little things that mattered: collecting shells, playing with our dogs, relaxing. Other thoughts: great book collection, great DVD's, loved the condo and highly recommend the place. Thanks for having us! Dave responded to all questions very quickly. Sent emails ahead of time with what to expect and things to do. Condo had a great view. Was quiet but it was February. Girlfriend loved the little white blankets. Beds comfortable. Plenty of room. We even got to take the car ferry from Southport to Fort Fisher which neither of us had even done so that was fun as was the close by aquarium. Overall a very nice place and stay. Only thing we would say is maybe add some Adirondack wooden chairs on deck cause the others were wet from rain and hard to clean plus so wet. Great place. Would stay again! Many thanks for your generosity. It was our pleasure to rent your condo. It was indeed a home-away-from-home with the comfortable furnishings and fun beach-y touches. Weve always tried to treat anywhere we stay as if it were our own thats what wed expect if we were lucky enough to be the owners, not the renters. We miss Carolina Beach already, even though we spent some of the day taking Jackson for a walk at the Biltmore Estate and followed that up with a pint with some friends at one of our microbreweries. If only the ocean were right outside our living room! Thank you for welcoming us into your fabulous beach condo! Our family had a blast - from the indoor pool to the beach. The location is awesome, convenient to everything yet away from the biggest crowds. Games and movies were perfect for end of the evening family time. We will definitely be back! The condo was clean and very nice. The view was amazing, we actually saw some dolphins from condo. Great access to beach. Would definitely stay again! It was a great place to enjoy our mini spring break. We had a great time and loved our little condo by the sea. Certain to be back as our boys are planning on attending school here. We loved the giant Godfather pizza from Michelangelo's! Thanks for everything. Not only was the location of the condo ideal, but David and Susan did everything to make our stay comfortable and convenient. It was really heart-warming to find that they thought of every little detail to make our stay relaxing and fun. Dave was ready to drop everything and come over when we had trouble setting the oven, but was able to trouble-shoot the issue by phone so that we could make some nachos. We enjoyed watching the dolphins from the comfort of the house when the weather was windy and cool. The sunrise views were splendid. I would recommend this place to anybody who wants to spend time in a nice clean, homey condo with great views and handy location. Excellent customer service, beautiful location, and excellent accommodations. We look forward to our next visit and won't use any other company! Great ocean views with the deck just about sitting on the beach. Easy access to the beach. Kitchen was well equipped and a washer/dyer in the unit. Property manager A1 Properties does a nice job equipping the unit is basics like toilet paper, dish and clothes soap, etc. For us its all about the beach and this place is all about the beach. Great place to just sit on the deck and watch the birds and dolphins. Unobstructed views from inside to condo of the ocean as well with large sliding doors from the family room and master bedroom. Very comfortable place! Thanks for letting us stay at your beautiful condo at the last minute. It was a MUCH better place to stay than the hotel we had originally planed to stay at. How can you beat "right on the water"! We really enjoyed ourselves. Thank you for providing your condo to us for a few days of rest. It was completely relaxing and the sound of the ocean was so peaceful. We had a great time. We are a retired military family of 23 years and we appreciate your generosity. Had a great time, enjoyed the view and the ocean sounds at night. Thanks for keeping the kitchen stocked, we had great meals including steaks on the grill. Comfortable layout for two families. Thanks for the kids stuff and the washer and dryer came in handy. God bless you. We had a wonderful week at the beach. Your unit 1305 is a very wonderful accommodation. We have been coming to Ocean Dunes for many years. We owned another unit there for awhile and sold it. We've been coming back every year since. We've stayed in a variety of units and your's has all the comforts of home. We're looking forward to renting this unit again. Thank you for all the finishing touches that are provided in your unit to make everyone's vacation memorable. Wow, what a pleasure it was to stay here. The deck is literally right next to beach and is a great place to sit out and relax. I don't know which the kids enjoyed more - the ocean or the pool. And having an elevator is great. If we had to lug all our stuff up and down three floors it would have been difficult in the heat. We will be back!!! We were so happy when we arrived at this condo in Carolina Beach. It is as beautiful as it looks. The view from the deck is amazing. We loved the beach and swimming in the waves. We would walk down to the boardwalk, and yes Britts Donuts is a must. We loved the fireworks on Thursday night. The condo has everything you need which makes the travel plans a lot easier. We would definitely come back to this paradise!